The Topsky is a 40" dlg with a glass fuselage and blue foam vacuum bagged glass covered wings. It is imported from Hong Kong and distributed by Hyperflight. The makers of the kit quote that the ready to fly weight is 150gm and Hyperflight claim 138gm. Measurements of the kit contents prior to build gave an estimated target of 157gm with a wing loading of 12.9gm/dm^2. This was felt to be heavier than I wished to fly at, so I had a close look at ways to lose some weight. .. I decided to epoxy the wings onto the pod so drilled out the captive nuts. 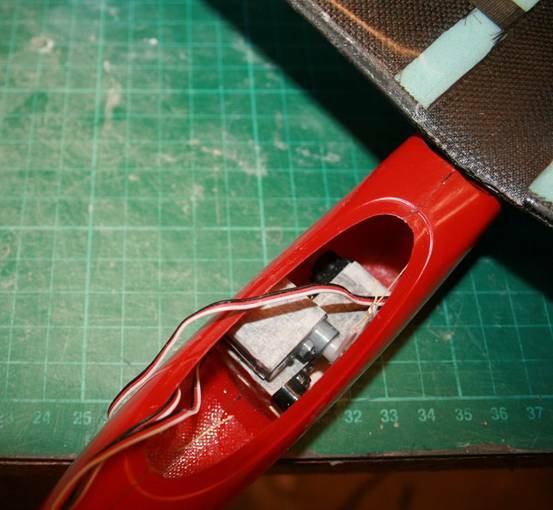 This is not a radical modification, contest free flight dlg's have their wings attached with epoxy . The saving was 3.3 gms. The 1mm holes are to help to key the wing. The following 2 pictures show before and after views of the pod. 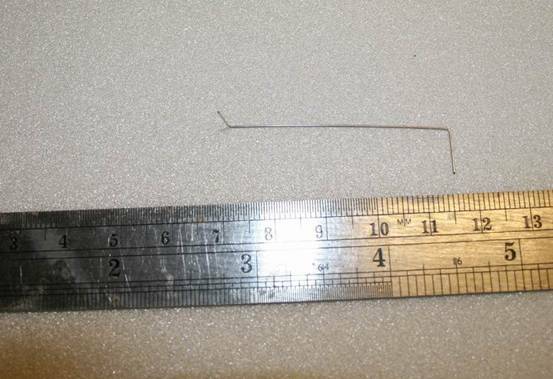 ..The kit was supplied with teflon snakes and 0.8mm steel wire for operation of the rudder and elevator. These were 6.8gm in total. They were discarded in favour of a Kevlar pull string and torsion bar. The weight of these replacement components was 0.1gm. The decision was made to run rudderless. The torsion bar was made from a length of top E string .008" in diameter, 55mm between centres. .much stiffer than all moving. The horns and clevis supplied were on the porky side so were replaced with 0.8mm ply and 0.8mm wire with 0.35mm piano wire keepers. The servo mounting plate was discarded. I did polish the boom for 10mins or so but soon got fed up with the mess it made and stopped before I covered the work area in fine carbon powder. 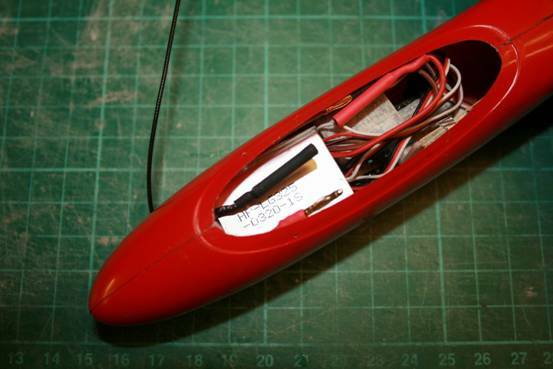 ..and I do not have to fiddle about digging material out of the wings to mount the servos as they are epoxy mounted in the middle of the pod without the ply servo mount. The advantage is a clean exterior with no external horns or pushrods and something to get hold of if you fancy a javelin throw. Only the top surface of the wings were joined with glass cloth as the bottom surface was supported by the fuselage flanges. These modifications reduced the fuselage weight from 48.9 to 30.2 gm , a saving of 18.7gm or 38.2% and the wing lost a further 4.4gms. Overall the weight of the bare airframe reduced from an estimated 121.2gm to an estimated 98.1gm. In practice, this came out to an actual 99.7gm. Perhaps I was overgenerous with the glue. The following table shows in detail the weight of the components before and after modification. Clearly the 6 gms saved by remaking the stab, fin and discarding the steel pushrods would reflect an 18-20gm nose weight to obtain a balance as my installation placed all the avionics as far forward as possible. Flying weight would be the wrong side of 170gm. I am very glad that I took the decision to save rear end weight. The reduced weight fin is flimsy and considered to be expendable. .The ailerons were driven by a pair of DS49 servos, wrapped in masking tape and epoxied to the floor of the pod. These were mounted in line. The elevator servo (Blue Arrow 3.5gm) was mounted on top of the aileron servos and the Kevlar pull line can just be seen on the right. The RX is a 7gm MPX RX5 run by a 350mah 1s Lipo with 2mm bullet connectors. Weight of the radio gear was 36.2gms giving a flying weight of 135.9gm. The battery is twice as large as need be but 11gm was required to balance the model and the 320mah battery was to hand at the correct weight for balance. Finally a view of the complete installation with the RX hidden underneath the LiPo. 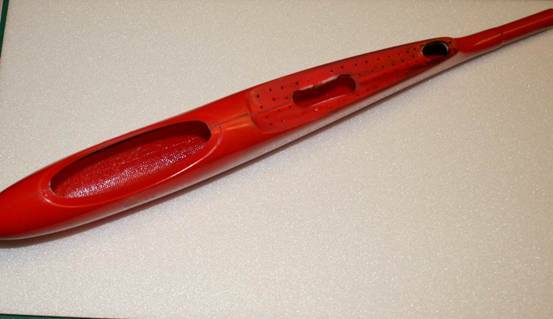 This is a robust mosquito size dlg with a substantial glass fibre fuselage and a glassed vacuum bagged blue foam wing which is easily repairable. It is not of the same quality as Vladimir's Elf and takes 3 or 4 times the man-hours to assemble. It should however take more abuse than the Elf. In its favour are a higher wing loading and hopefully more precise roll control via the full length ailerons. A computer based TX provides spoilers and elevator compensation for precise landings. The Topsky was flown in 3-5mph at Ferry along with a standard Elf. First impressions were that the Elf was not happy in gusty conditions and was more difficult to fly accurately. The Topsky has a much higher wing loading and therefore the glide was not as good as the Elf but it offers flat thermal turns with predictable handling. At this point, I prefer the Topsky as capable of flying without drama in a wider wind speed range than the Elf and in an unfussy manner. This argues for aileron roll control even at mosquito size 40" dlg's. The Topsky is quite happy on 1 cell using about 35 mah per hour of battery capacity. I did not miss the rudder and the wings are still attached to the fuselage. 3. Spoiler setting as much as I can get, about 10mm down with 1mm EL compensation. This function on the TH stick. Additionally for launch I have 0.75mm of down programmed into the LH momentary button using the MPX FIX function. This is the control that the AEROBATS might use for push button rolls and overrides all other settings. Exponential and rates are not used. This is a personal issue and not to everyone's taste.